Your child has asthma, which causes the airways of the lungs to swell and narrow. Now that your child is going home from the hospital, follow the health care provider's instructions on how to care for your child. Use the information below as a reminder. In the hospital, the provider helped your child breathe better. This likely involved giving oxygen through a mask and medicines to open the lung airways. You may need to take time off work to care for your child. Make sure you know the asthma symptoms to watch out for in your child. You should know how to take your child's peak flow reading and understand what it means. Know your child's personal best number. Know your child's peak flow reading that tells you if their asthma is getting worse. Know your child's peak flow reading that means you need to call your child's provider. Keep the phone number for your child's provider with you. Grass that has just been mowed. Starting and stopping an activity too fast. Try to make sure your child warms up before being very active and cools down after. No one should smoke in your house. This includes you, your visitors, your child's babysitters, and anyone else who comes to your house. Smokers should smoke outside and wear a coat. The coat will keep smoke particles from sticking to clothes, so it should be left outside or away from the child. Ask people who work at your child's day care, preschool, school, and anyone else who takes care of your child, if they smoke. If they do, make sure they smoke away from your child. Your child should be able to take asthma medicines at school when needed. School staff should know your child's asthma triggers. Your child should be able to go to another location to get away from asthma triggers, if needed. National Heart, Lung, and Blood Institute website. National Asthma Education and Prevention Program Expert Panel Report 3: Guidelines for the diagnosis and management of asthma. www.nhlbi.nih.gov/files/docs/guidelines/asthgdln.pdf. Updated April 2012. Accessed June 18, 2018. 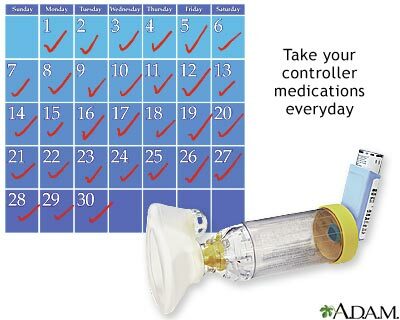 Control drugs for asthma must be taken every day in order for them to work.